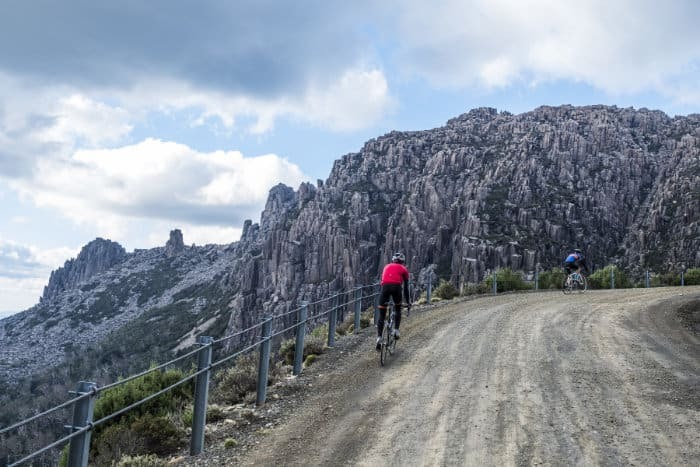 If you are looking to combine a European style alpine switchback cycling experience with a magnificent gravel road riding then the Ben Lomond ascent is a ride for you. 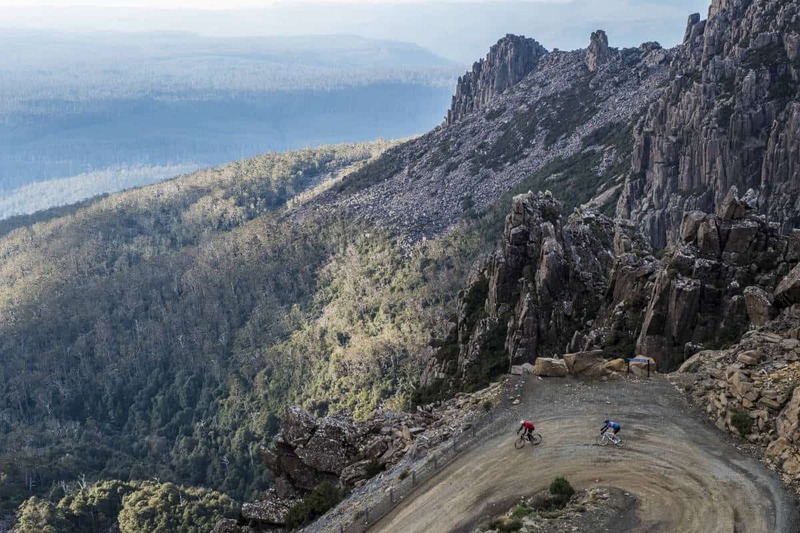 Rated on Climbbybike.com as the 9th hardest climb in Australia the magnificent dolerite columns of grey imposing rock create a magnificent backdrop whilst you grind away the steep ascent. We begin the 110km return ride at the Ingleside Bakery Café in the beautiful historic town of Evandale. The café offers a magnificent alfresco dining experience and a great coffee at the gentlemen’s hour of 8.30am. After your late breakfast café one short sharp section of the Launceston classic, White Hills Road will increase the heart rate and help you work off some of the delicious treats from the bakery. This 1.3km climb after Rose Rivulet is a good opportunity for the polka dot jersey holder in your group to send a message to the rest of team what is in store for them later in the ride. Turn right onto the Blessington Road C401 for a stunning approach to the foothills of Ben Lomond. You will appreciate the vineyards covering the hills to the south and the quite country road. The sounds and smells from the bubbling North Esk River are your companion in sections of this road as you pass through open farming country, sections of native forest and finally enter into areas of plantation forestry. Throughout the journey the masiff of Ben Lomond gets closer and as you pass the Blessington Hall a quaintly named stop, enjoy the last of the tarmac as the final gravel section is upon you. Turn off the bitumen at the Ben Lomond National Park sign to begin a 17km climb of over 1000metres. It is a well formed gravel road that at times can get quite busy. On our ride we passed only three vehicles on the entire climb and during the spring and autumn months this is pretty typical traffic volume. The road is well formed and in sections is magnificently smooth and occasionally muddy. The 9.4km section up to the camping ground averages 6.5% and present no real difficulties. You’re well over halfway there. Make sure you’ve got some extra layers on hand about now and consider an extra bit of fuel for the exertions to come, the temperature dropped dramatically for us over the next few kilometres and we knew we were in an alpine environment. You will pass the ranger checkpoint where in winter your parks pass would be checked and you would be asked to fit your snow chains if you were in your vehicle heading to the summit. Probably best not to keep riding your road bike at this point if you’re being asked to fit snow chains!! You’ll get some glimpses of rocky dolerite scree slopes through the forest on your right as you skirt around the mountain before the forest starts to thin to reveal a solid wall of grey dolerite columns looming ahead. 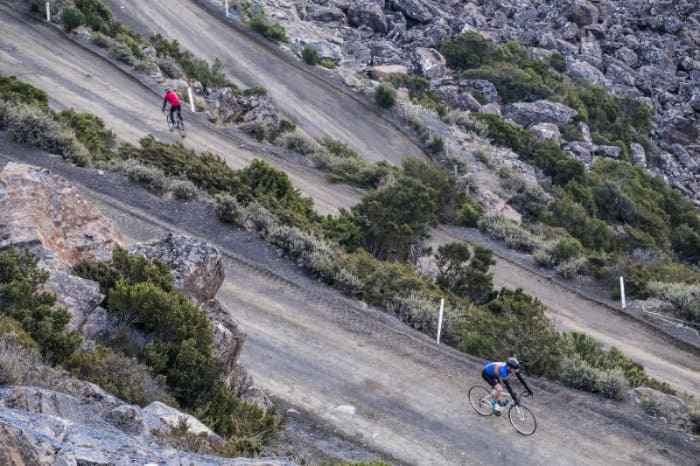 This is the moment you’ve been waiting for as you start your way up these famous switch backs. The surface is loose and you need will need to shift your weight carefully to keep traction, particularly as you round each of the tight corners. Every corner presents another magnificent view and the extra layers are not that important as our merino kit helps to wick the ever increasing sweat away from our skin. Squeezing through a gap between large boulders marks the end of the 1.5km switch back climb and brings you to a brilliant lookout. 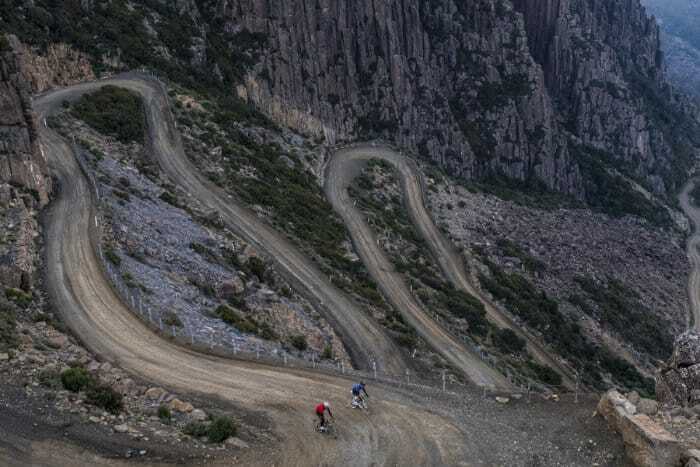 All of the classic Jacob’s Ladder photos are taken from this area and it is good to have a support crew in place ahead of time to get the dramatic pictures of your climb up this classic. Now you have reached the plateau you will almost certainly be needing those extra layers. The gentle breeze we experienced was nothing compared to the gusty freezing conditions often found on the mountain. Another 2.5km and you will reach the main alpine area and with a bit of luck there will be a hot drink available. The Ben Lomond Alpine hotel that was here, recently burned down and there may not be an option for a hot chocolate or coffee when you finally do arrive. They are currently only opening over the weekends in a temporary structure. The return journey is equally spectacular with magnificent mountain views as you look to the North-West at Mt.Arthur and Mt.Maurice in the North. Great care needs to be taken on the descent through the gravel switchback. A number of road cyclists have lost some bark on this section of the descent. If 34km of gravel in one day is not enough for you could break up the return trip home with two alternative side trips. The first option is a detour via Deddington which will add an extra 2 km to the journey and another 9km of gravel road. The second option is to turn left at Disputed Rd and the right onto Logan Road which will wind its way back into Evandale, actually cutting. It is a little bit unsettling on this remote, quiet section of road for the first 5 or 6 kilometres with the occasional banjo strums catching your ear on the wind. It does cut approximately 8km off your total return trip and rewards you with some beautiful views as you return to Evandale. Finish off the ride with a thirst quenching James Boags ale at the Prince of Wales pub and enjoy some live music on a Sunday afternoon as you wind down from a Tasmanian epic.